The Branch Pub of the Year 2005 Presentation was on 7th June. Food is available at lunchtime and 5-8 Tuesday-Saturday. A pub which very nearly died has been voted Pub of the Year by the Cambridge Branch of CAMRA (the Campaign for Real Ale). 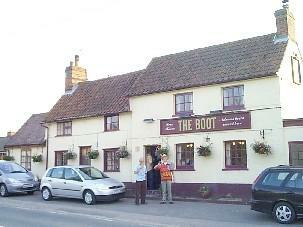 Five years or so ago, The Boot at Dullingham seemed doomed. Its owners, Greene King, had declared it unviable and applied to East Cambridgeshire District Council for planning permission to turn it into a private house. This resulted in a vigorous "save our local" campaign by the villagers (the other pub in Dullingham being run essentially as a restaurant). Fortunately the District Council was convinced by their arguments and the planning application was refused. Greene King then reluctantly offered the pub for sale. Local couple Kevin and Dianne McDonnell stepped in and the pub reopened in August 2001. Since then their hard work and enthusiasm has been well rewarded. The Boot is a true community local, right at the heart of village life, offering a meeting place for many local societies and sports clubs as well as being a brilliant place just for a drink and a chat. It has won a regular place in CAMRA's Good Beer Guide, selling two beers from the legendary Suffolk brewers Adnams (Bitter and Broadside) plus a regularly changing guest beer. CAMRA Branch Pubs Officer Paul Ainsworth said "The Boot is living proof that, in the right hands, there's no such thing as an unviable pub. Kevin and Dianne have made this a pub which the whole village is proud of and which has a true community spirit. The fact that it sells superbly kept beers is a particular bonus". Evening trains between Cambridge and Dullingham are rather infrequent. The timetable from 2003 gives a general idea, though the exact times have changed. For instance as of April 2005 the weekday evening return trains are 19:21 and then 22:21. Bus service 17 from Drummer Street goes to Dullingham but seems to end around 19:00 as of April 2005.